This volume presents 64 Pastorale compositions for organ (harpsichord/pianoforte) of the 18th century from Germany, Bohemia, Austria and South Tyrol. Charming melodies shaped by natural notes, bordoun basses, a lyrical-cheerful or sensitive tone – these are some of the common characteristics of the works in this collection. Several of them are connected to the custom of the "Kindlwiegen" or cradle song. Those in search of new discoveries will also find a number of first editions here. Almost all of the pieces can be played manualiter and range from easy to moderate level of difficulty. 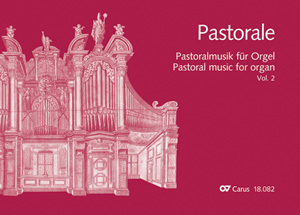 Together, both Pastorale volumes display an impressive kaleidoscope of the different national characteristics of the pastorale and offer a rich repertoire for organists, not only at Christmas time. Wie immer ist das Carus-Druckbild vorbildlich und die Handhabung der Sammlung sehr benutzerfreundlich.